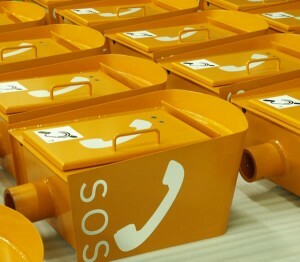 T611D Telephone Housing - Henry Williams Ltd.
An essential piece of safety kit on our roads, the HA Type 611D telephone enclosure is manufactured from aluminium and powder coated orange in accordance with TR2180 with SOS identification. It is designed to MCX 0311 to meet the Highways England specification for housing the network telephone handsets. The cabinet design is approved to TR1100 and passed all environmental and EMC tests in accordance with TR2130. These have been carried out by an independent accredited organisation which allow it to be used on Highways England and Local Authority managed roads. The telephone handset is accessed by a hinged door which is secured using a magnetic strip catch and is accessible without a key. The standard roadside telephone enclosure is supplied empty. It is mounted on a Post Type 71 which can either be base plate mounted or on a hockey stick and designed to MCX 0068.